Bulgaria's Ministry of the Interior has created a computer image of a suspect believed to be involved in the July terrorist bombing in Burgas, Bulgaria. Terrorists targeted a bus carrying Israeli tourists, murdering five Israelis and a local driver. 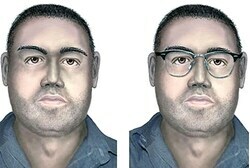 The picture shows a heavy-set man with a slightly dark complexion, black hair and brown eyes, who may have been wearing glasses. He carried a driver's license and used various false names. sizcache="3">Bulgarian police believe the suicide bomber who died in the blast was not acting alone. "There is evidence that this man is connected to the terror action in the Burgas airport," the Bulgarian Interior Ministry said in a statement. It asked the public for information regarding the suspect. An Israeli official source quoted recently in the New York Times said Israeli intelligence has evidence that terrorists in Lebanon were involved in the attack as well. There was a rise in the number of telephone calls between Lebanon and Burgas in the two months that preceded the attack, the source said, and an even more marked spike in the three days that preceded the attack. The Times said that Bulgarian intelligence's investigation of the attack has reached a dead end, and that the identity of the bomber or his accomplices has not been established.